How gorgeous is this??? My sachets are especially unique because I use my Herbes de Provence blend! It consists of primarily lavender mixed with rosemary, thyme, savory, fennel seeds, basil, and marjoram. Souper Spices Sachet is soooo wonderfully aromatic you won’t believe your smeller! 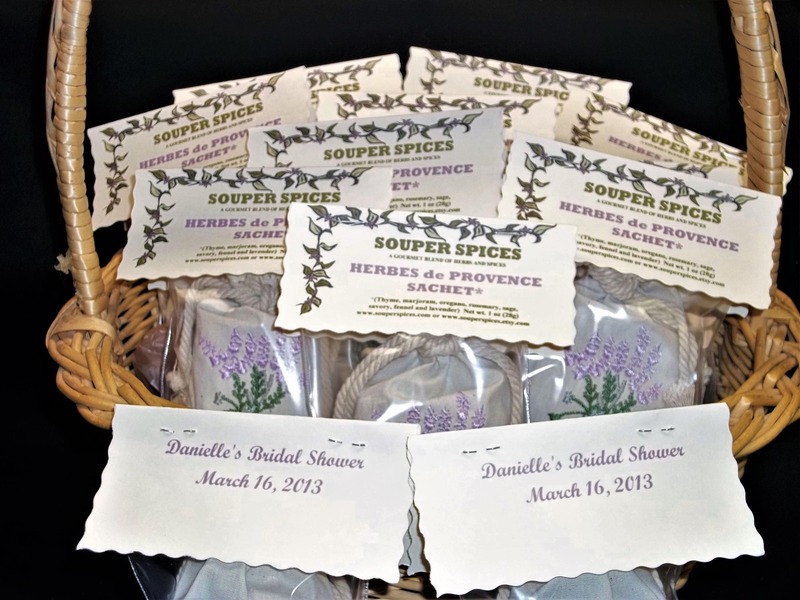 I had so many requests for Herbes de Provence since I have been doing my samples and while taking a few days off with my niece, Loryn, we came up with this fantastic idea. A customer of mine sent me an e-mail and said how she received my sample and threw it into her car. The next day, she let me know how her car didn’t smell like a foot locker anymore and couldn’t wait to try the recipe included. It just made me laugh hysterically! Next, I found these really neat bags and the rest is history. Although lavender is such a beautiful herb, it doesn't hurt to kick it up a notch. So far as I know, no one has thought to use this blend as a party or wedding favor, car deodorizer, dresser drawer or shoe freshener not to mention in your favorite recipe of dumplings, stews, soups or on your veggies. Ingredients: Rosemary, Thyme, Savory, Fennel Seeds, Basil, and Marjoram. 5/1 TB servings. 1 oz (28 g). I can customized these for any occasion, too! For larger orders, go here: https://www.etsy.com/listing/101735918/wedding-favors-lavender-sachets-lavender?ref=shop_home_active_15, or contact me and I will do a special order for you. These will ship in 1-2 days for 20 count. Please allow 1 1/2 weeks delivery for larger count. Thanks!